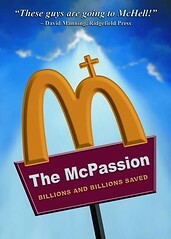 Hat tip to fettman for giving me a link to The McPassion, a 4-minute short comedy. I don't know that a short comedy like this is an appropriate way to depict Christ. I wouldn't be comfortable putting together something like this, anyway. It is pretty funny, and it does a pretty good job of showing where we could end up with the increasing commercialization of faith. What do you guys think? Did you think the short was funny? Is the just completely offensive and should never have been made? Should Christians rise up worldwide and riot? If so, should the other faiths that are briefly mocked at the end also rise up? If so, since their mockery was brief, should they contain their indignation to bar fights instead of full-scale riots? What about the underlying message of comercialization of faith? Have we already gone too far? Is some commercialization acceptable? Necessary? How much? Am I asking too many questions? These kind of spoofs are, in my opinion, unnecessary. In light of current events, I would have to state that it would knowingly offend more people than make laugh. While I am not close to these issues, I still feel uncomfortable watching it or parodies like it. Addendum: These are ideals that reside at the very core of many individuals. Making light of that is cold-blooded, dude. I'm not outraged by caricatures of Mohammed. Why get upset with something like this? As a Christian, you are specifically called to endure ridicule and persecution for your faith. What I think this pokes fun at is the rituals and symbols that have become meaningless in worship. It's meant to ridicule "fast food" Christianity. Art is meant to provoke feelings, both good and bad. Rather than be upset at the artist, I think it's better to look at why you are upset and decide how to positively address things. It's very easy to say that a particular artistic expression should be eliminated, but much more effective to make it harmless.